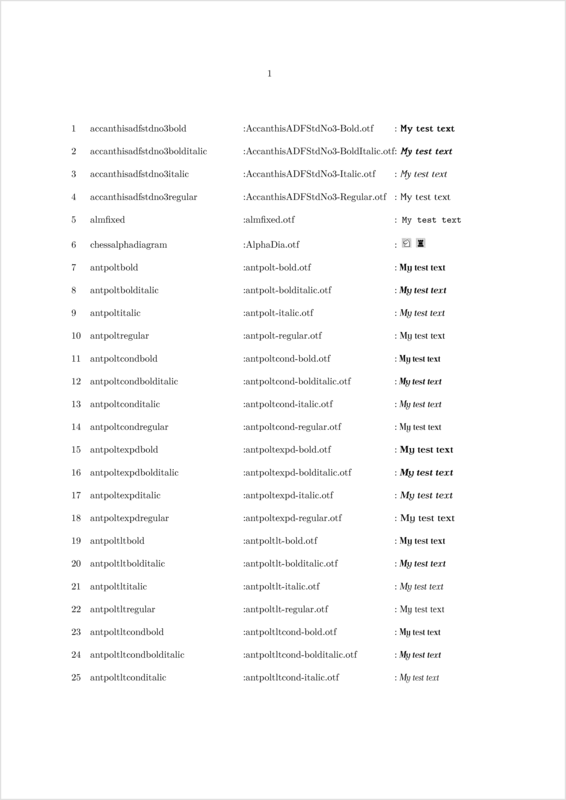 The following will list all the fonts, but I would like to take it a step further and render a sample of each font. How can ConTeXt render each font in its respective font? Maybe LuaTeX would be good for this? http://wiki.contextgarden.net/Font_Switching suggests three other articles, but I can't tell which is relevant. % a few macros in your document which are provided for this purpose. Use \definedfont[file:<filename>]. Alternatively, \definedfont[name:<fontname>] would also be possible but thereby you just instruct the fontloader to do the fontname-to-filename resolution again, which is pointless because you already have the filename. More info can be found in »Fonts out of ConTeXt« aka Hans' new font manual. and no pages output. For the first 100 it works okay and I include the first page of this output below. How to use OpenType fonts with plain-LuaTeX? How to change the font formatting in the text and numbers of footnotes in ConTeXt?